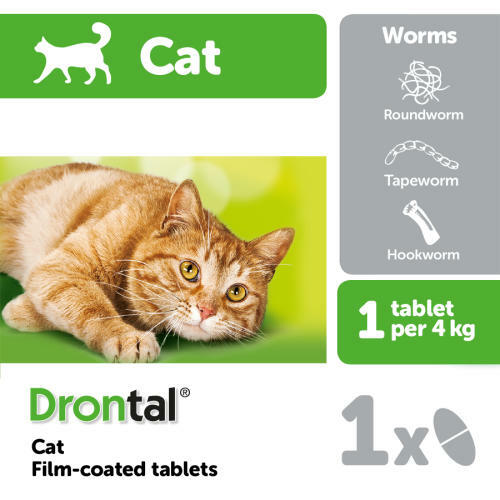 Drontal Cat worming tablets kill every type of intestinal worm commonly found in UK cats. A single does every 3 months is generally sufficient for most cats, although hunting cats may need to be treated more often. Treat your cat at least every 3 months to help her lead a happy and healthy life. However, if your cat is a known hunter, monthly worming may be advised. Why your pet needs Drontal regularly? Parasitic worms infect most cats at some time in their lives. They can damage your pet's health and worse still your family's. How often should we treat for worms? It's is difficult to prevent worm infection so it is a good idea to treat your cat or dog regularly for worms. If you worm at least every 3 months it will help keep your pet healthy and importantly vastly reduce the number of worm eggs shed into the enviroment.